Technology isn’t winning any friends in U.K. transport workers’ unions, right now. Nor is London’s mayor, Boris Johnson, who yesterday announced that almost all ticket offices on the London Underground transport network would close by 2015, with the loss of around 750 jobs. There are 268 ticket offices on the network in total, and around 260 are set to close with only large stations, such as King’s Cross and Heathrow, due to retain a staffed facility in future. Johnson argued that contactless ticketing via London’s Oyster cards (pictured above), and direct contactless payments for ticketing — support for contactless bank payments at ticket gates is being added to the network next year — are making the need for staffed offices, where uniformed people issue printed paper, redundant. The big driver, though, is of course money: aka the £270 million savings the plan will generate over five years. But while technology destroys one set of jobs, ecommerce may be creating others. Or at least repurposing the space where tickets used to be issued by humans with another set of — you guessed it — self-service machines. Ecommerce giant Amazon is reportedly in talks with Transport for London to use the closed ticket offices as “drop off” points for deliveries. The Amazon talks were reported earlier by the FT. The Guardian also said TfL was talking to unnamed “online retailers” about converting ticket offices to “drop-off” or “click-and-collect” points for goods. Back in September, another ecommerce giant eBay kicked off a “click & collect” service in the U.K. where buyers can nominate a physical retail store location for their goods to be sent. 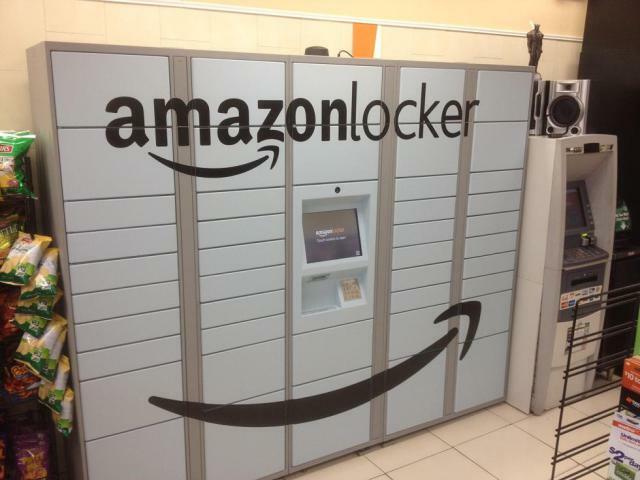 Meanwhile, Amazon has been building out its own Lockers program for more than a year — which lets Amazon customers select a local place such as a 7-Eleven or a station to have their goods delivered to, rather than their home or work address. The Lockers, pictured below, use a one-time code system for people to collect their deliveries. So again, there are no humans required to staff the machines — although humans are still required to stuff the stuff in the machines in the first place (but likely fewer than 750, in the case of the TfL jobs being removed by contactless payments). It makes plenty of sense for Amazon to be eyeing up prime Tube real-estate — which could enable it to build out a whole conveniently-sited network of its delivery Lockers in the U.K. Capital — giving London’s commuters a handy stop-off point to get their goods. However the company declined to comment or confirm it has plans for repurposing the Tube’s ticket offices. “We do not talk about plans we may or may not have for the future, so I am unable to assist with your query on this occasion,” a spokeswoman told TechCrunch. Amazon does already offer its Lockers service in the U.K. — it has 270 in all, with a total of 12,000 slots for individual deliveries across all those machines. But getting its Lockers in a very high traffic location, such as the London Underground, would vastly increase their visibility, as well as bumping up the number of deliveries its Lockers can accommodate.